In today’s automotive market, when eight cylinders is considered the ante for most serious luxury cars, it may be disconcerting to think that a hundred years ago, four cylinders was considered a luxury. Packard’s earliest cars had one-cylinder engines, as did early Cadillacs. The development of Packard’s first four, the 1903 Model K, was a matter of some internal controversy; some Packard executives felt the company should concentrate on cheaper one-cylinder runabouts. 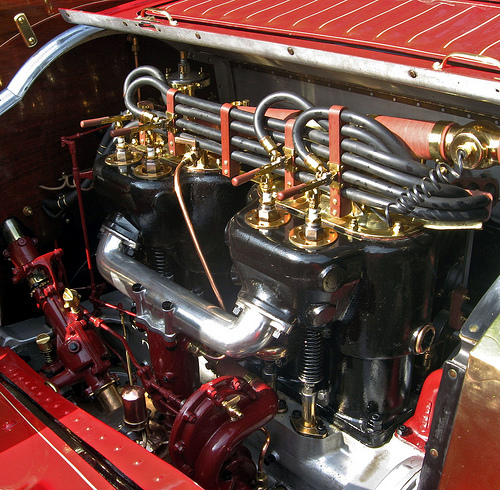 By 1906, however, Packard had dropped its one- and two-cylinder engines in favor of a T-head inline four of mammoth displacement, initially 350 cu. in. (5,734 cc), soon increased to 432 cu. in. (7,079 cc). This was supplemented in 1909 by the cheaper Model 18, powered by a 266 cu. in. (4,359 cc) four. The engine that preceded Packard’s first sixes was this massive T-head four, seen here in a 1910 Model 30 Gentleman’s Runabout. With a 5-inch (127 mm) bore and 5.5-inch (139.7 mm) stroke, the engine displaced 432 cu. in. (7,079 cc) and developed about 30 hp (22 kW). The engine of the cheaper Model 18, introduced in 1908, displaced 266 cu. in. (4,359 cc) and claimed 18 hp (13 kW). Both sixes were adequately powerful, but Jesse Vincent, who became Packard’s chief engineer in 1912 and VP of engineering in 1915, was not satisfied. Both of Packard’s sixes were huge and to make them bigger — the surest way to produce more power — would make them prohibitively heavy. As it was, their wide bore (4.0 inches/101.2 mm for the 38, 4.5 inches/114.3 mm for the 48) required a long, heavy crankshaft and a massive flywheel. Vincent wanted an engine with a shorter, lighter crankshaft that would allow a large displacement while keeping the swept volume of each cylinder relatively modest for greater smoothness. Smoothness was a particular concern. In those days, automobile engines were generally bolted directly to the frame; vibration-damping engine mounts were years in the future. One of the attractions of the straight six is its inherent balance — the forces exerted by the pistons and connecting rods cancel each other out, so there’s none of the shake that afflicts inline two-, three-, four-, and five-cylinder engines. Vincent was loath to sacrifice that balance, which led him to eschew the V-8 layout that Cadillac adopted in 1914. A straight eight, meanwhile, would present the same problems of weight and crankshaft size as a bigger six. The solution, which Vincent pitched to the Packard board in early 1913, was a V-12. Since the V-12 was, as Vincent explained, essentially two straight sixes with a common crankcase, it preserved the six’s inherent balance and smoothness. It also provided comparable displacement while minimizing the swept volume of each cylinder. That first Packard V-12 engine, dubbed “Twin Six,” displaced 424 cu. in. (6,950 cc). Its cylinder banks were set at a 60-degree angle, providing even firing intervals and making the V-12 narrower than a 90-degree V-8. Like the smaller six of the “38,” the Twin Six was an L-head engine, but it had two camshafts, obviating the need for rocker arms. In the mode of European high-performance engines of its day, it had a narrow bore, only 3.0 inches (76.2 mm), and a long stroke — 5.0 inches (127 mm) — allowing the crankshaft to be shorter, more rigid, and considerably lighter than the six; Packard claimed the Twin Six weighed 400 lb (181 kg) less than the six-cylinder “48.” Despite its smaller displacement, the V-12 was slightly more powerful than the six — 85 hp (63 kW) at 3,000 rpm, compared to 82 hp (61 kW) at 1,720 rpm for the “48” — and had vastly more torque. The Twin Six was introduced in May 1915 as a 1916 model and immediately became a sensation. Although Packards were too big and too heavy to be considered true performance cars, in July 1915, race car driver Ralph De Palma lapped the Chicago Speedway in a Twin Six touring car at an average speed of 72.7 mph (117.1 km/h), a formidable showing. The V-12 was also adept at that favorite test of prewar motoring, pulling from 3 mph (5 km/h) to top speed in high gear. The Twin Six sold quite well, doing wonders for Packard’s bottom line; between 1917 and 1919, the company’s annual net profits were around $5.5 million. The Twin Six completely overshadowed the six-cylinder cars, which were discontinued in September 1915, and remained in production through June 1923 with various minor refinements. Packard sold 35,102 Twin Sixes in all, a remarkable total for such an expensive car. (List prices for the 1916 Twin Six had ranged from $2,750 to $4,800 with factory bodywork, roughly $55,000 to $100,000 in 2010 dollars.) The Twin Six also inspired, at least in part, the 12-cylinder “Liberty Engine” used in many Allied aircraft and tanks; Jesse Vincent helped to design the Liberty along with Elbert John Hall of the Hall-Scott Motor Company. The end of World War I left the European economies in ruins and led to a severe recession in the U.S. Even before the Armistice, Packard president Alvan Macauley decided it would be prudent to offer a smaller, cheaper model. This emerged in September 1920 as the Single Six, powered by a new 242 cu. in. (3,958 cc) L-head six with 52 hp (39 kW). Although the Single Six was a sales disappointment — in part because it still cost a lot more than a V-8 Cadillac — it outsold the costlier Twin Six, whose sales fell from over 5,000 in 1920 to around 1,300 in 1921. By 1922, it was clear the V-12 engine had run its course. Packard considered developing a new Twin Six, but opted instead for a straight eight, essentially the Single Six engine with two more cylinders and a heavier, nine-bearing crankshaft. The eight initially displaced 358 cu. in. (5,864 cc), but it made 85 hp (63 kW), nearly matching the 90 hp (67 kW) of the final Twin Six. Dubbed “Single Eight,” the new engine replaced the V-12 in the summer of 1923. 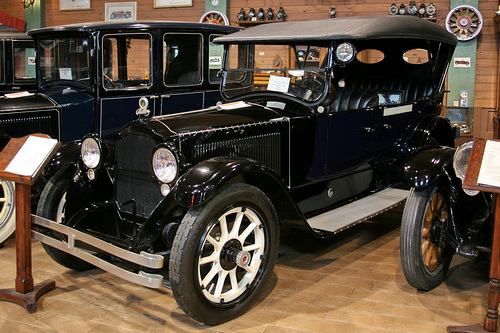 The Single Eight, renamed simply Eight in 1925, would become Packard’s mainstay for the next decade. Packard would return to the Twin Six concept seven years later, but the new V-12 engine was planned for a very different market and a very different configuration. If all had gone as planned, it would have become Packard’s first front-wheel-drive car. A Packard Custom Eight dual-windshield phaeton of the Fourth Series, 1927-1928. It’s powered by the 385 cu. in. (6,306 cc) straight eight with 106 hp (79 kW). This car was originally priced at just under $4,000, decreased by about $100 in early 1928. Dual side mounts were standard equipment, although in March 1928, Packard introduced a cheaper “Standard” series with rear-mounted spares. The Fourth Series was the last year for the Six, a 289 cu. in. 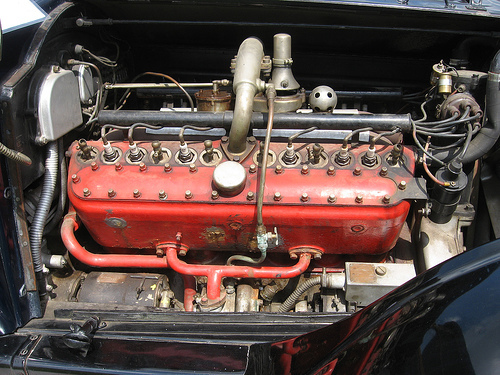 (4,730 cc) engine with 81 hp (60 kW); Packard would not offer another Six until 1937. Thankyou for including pictures of the motor you have chosen to highlight this week. Now if you could only publish those pictures of all those automatic transmissions you wrote about a few weeks ago. It is fascinating how determined some folks are to “sell the story” that the Packard Twelve and Super Eight “shared the same chassis”. What possible advantage is there to trying to re-structure history, meaning “fake it”? First of all, while Packard CALLED the 1937-1939 Packard “senior” eight cylinder cars “Super Eights”, of course they were not; the “REAL” 384 cu. in. motor was discarded in place of the smaller, cheaper, and much less powerful “Standard Eight”. To suggest that there wasn’t much performance difference between the standard 320. cu. in “L” head eight, and the 473 “wedge-shaped combustion chamber” Twelve, with its vastly more modern, more sophisticated, and larger “breathing” capability, tells us more about the writer’s objectives, than it does about the two cars. In fact, the much more powerful Twelves required heavier brakes, suspension components, and wheels. True, the “seniors” all used the same exterior sheet metal, but underneath were quite different automobiles, with significant performance differences. Oh well – i guess if you have to sell used cars, any silly story will do if it gets the iron off the lot….! The use of the term “chassis” on p. 4 of the story was perhaps misleading; “wheelbase” is more correct, and the text has been amended accordingly. Yes, the Twelve had heavier components to deal with its greater weight and performance — only a small portion of the weight difference between it and the Super Eight was attributable to the engine itself. I don’t dispute that the Twelve was significantly more powerful and more sophisticated than the contemporary eights. However, against that greater power was balanced the much greater weights of the Twelve, which according to Packard’s own figures exceeded the Super Eight by 700 lb or more, body for body. If there were figures available for comparable acceleration times and top speeds, I would happily include them here, but the sort of track testing that became ubiquitous later was not yet common at the time, so there are not vast sets of road test figures to consult. However, the power-to-weight ratios are not as different as the power outputs. Much of the information on the body and chassis changes to the Twelve came from A. Leslie, Jr., “Cloaking the Ultimate in Conveyances: Twin Six and Twelve Coachwork, The Ninth through the Seventeenth Series 1932-1939,” in Kimes. If you can provide reputable alternate sources, I would be happy to consult them and revise the text as needed. The author has no “objective” other than to recount the history of these cars in a reasonably accurate fashion, and is puzzled by the allegation that he would somehow benefit from misrepresenting the facts. Both the 120 and the Twelve are impressive cars. The problem with preferring one over the other is that, in the end, Packard needed both types of vehicle to survive. The 120 was an impressive car in its own right, but it was the “Senior” Packards – especially the custom-body Twelves – that gave it prestige. When the 120 debuted, it was a huge success, but a big part of the reason was that upper-middle income people were excited about being able to buy a car with a very prestigious name. That image had been forged by the luxurious, very well built, and superbly engineered, Twelves and Eights. Imagine today if Rolls-Royce came out with a very well-made and well-engineered car that cost $50-55,000 and featured the traditional grille and hood ornament. People would be lining up around the block to buy one, even in this rotten economy. The problem was that once the Twelves were gone, and the 120 became the company’s bread-and-butter, Packard’s survival depended on selling cars to a different type of customer. Traditional Packard customers were ultra-conservative when it came to new styling and engineering features. The 120 competed against the Buick, and those buyers expected flashy performance and up-to-the-minute styling (not to mention relatively frequent facelifts and body changes). Packard wanted to sell lots of medium-price cars, but wanted to do it the old-fashioned way, using approaches to styling and engineering that had worked for the “Senior” cars. That wasn’t going to work anymore, especially during the postwar years, when GM wowed the public with new engines, body styles and styling features. An ultra-luxurious, “utlimate” Packard in the vein of the prewar Twelve would have at least reminded people about what the Packard name once meant. Even if the bar for refinement was lower in 1906, I’d think this would be unacceptably rough. Perhaps it was offset by low rotational speed? I heard it running, and while it was obviously no Lexus, it didn’t strike me as any rougher than, say, a diesel bus engine. I don’t think its peak speed was more than about 2,000 rpm, so that probably helped, and it was obviously meticulously built. Just came upon the article. Nicely written and appreciated. Curious about a comment made that the actual weight difference between the Twelve and the Super Eight engines were small. My impression (for lack of hard numbers other than gross vehicle weight) is that they were significant and that the Twelve’s upsized chassis components comprised the lesser weight increase. Does anyone know the actual engine weights? Really liked the comment about the Rolls-Royce analogy and need for a strong Senior line-up. Points well taken. Regarding the argument that Packard customers were conservative when it came to new styling, I think the evidence is murkier. The advertisements of the 20s and 30s extolled the sleek, long and proportionally low bodies. They wouldn’t have done that if Packard’s customers weren’t persuaded. Packard’s Seniors went through a styling evolution from 1924 to 1936 that reflected a strong desire on Macauley’s part to master the automotive form, even if it necessitated an occasional revolution. The 1932 grill was a prime example – very gutsy for its day and understandably requiring Board approval. Where Macauley & Co. seemed to run low on creative gas was in the late 30s when styling had expanded beyond grills, fenders, hoods and ornamentation to include the entire body, particularly the greenhouse. In this respect it was the GM that got out in front with the Cadillac 60 Special and from that point forward Packard seemed to increasingly struggle with design. The evidence is pretty clear that they never elevated it to the same level of corporate importance that GM had until the mid-50s, when it was too late. Still, even smaller differences in engine weight can require substantial beefing of mounts, transmission, driveline, cooling system, etc. As a point of comparison, in the late sixties, adding Ford’s big FE engine (390/427) to a Mustang or Fairlane would add something like 300 lb to the curb weight, compared to the small block V8. The Ford 289/302 weighed around 485 lb dry, and I’ve never seen an estimate for the FE that was more than about 650 lb, so only about half the weight penalty was the extra mass of the engine itself. As the article sidebar mentions, obviously the younger Macauley had no direct involvement with Packard styling in the late twenties, which was before he joined the company. The real responsibility for that evolution, particularly before about the Ninth Series, lay, by most accounts, with Werner Gubitz, who was able to synthesize both the disparate ideas (Macauley’s and those of Packard’s outside consultants and contractors) and the general trend in unification of form that was taking place in that era. There is no doubt that the Sixty Special caught Packard off guard in 1938. In fact, Maurice Hendry’s Cadillac marque history excerpts a letter from someone in the Packard engineering department to George Christopher in 1944 that explicitly acknowledges the Clipper as continuing a trend GM had started. It’s worth noting, however, that the Sixty Special was less a triumph of GM’s corporate foresight and more of the determination of Harley Earl. Both Nick Dreystadt, Cadillac’s general manager, and Don Ahrens, the general sales manager, were exceedingly nervous about the Sixty Special, which they thought would be a little too much for their customer base. Had they put their foot down (as happened with Earl’s initial efforts to push for headlights integrated into the fenders), it might very well not have happened at all. Earl did not become a corporate vice president until 1940, so before that, he didn’t have a lot of real authority within the corporation, other than his personal charisma and his relationship with Alfred Sloan. I would call the Sixty Special a very near thing, and without it (or if it had been the abject flop Don Ahrens feared) the story might have been quite different. I suspect the failure of the Light Eight had less to do with aesthetics than with brand image. The point of an entry-level car (even one in the $1,900 range, which was hardly inexpensive) is to reach aspirational buyers who can’t afford the senior models; the point is defeated if the entry-level model doesn’t look very much like the senior cars. Conversely, the One Twenty and Six succeeded in large part because they DID look like the senior models. The stylistic virtues of those cars was less significant than the fact that Packard still connoted respectability, and the junior cars were still very recognizably Packards. If the Light Eight had been a hit, thought, it would have put Packard in a different awkward spot. Trying to have styling ‘trickle up’ from junior to senior cars is a perilous endeavor (witness Virgil Exner’s efforts to apply the themes of the Valiant to the bigger and more expensive Chryslers). In that sense, they would probably have had more luck if they’d positioned the Light Eight as a more expensive style leader, like the Sixty Special or the early Clipper, rather than as an entry-level car. I’ve lifted both with my engine hoist and it’s a noticable difference to the hydraulics! The 320 and 384 eights (standard and super/deluxe) had aluminum crank cases with bolt on cast iron cylinder blocks while the twin six/twelve of 32-39 was a monoblock casting, all cast iron. It really is a big chunk of metal! Believe it or not the chassis differences weren’t huge from 32-36 at least. 37 abandonded the big eight and moved the 320 to the Super Eight level. Thanks for the weight info. For an apples-apples vehicle comparison between the 320, 384 and 473, I think it might be most accurate to use something like the 1936 Dietrich Phaeton because the bodies were probably trimmed similarly between the three. Weights are 4990, 5080 and 5480 lbs, respectively, or a 490 lb increase from the 320 to the 473, and a 400 lb increase from the 384 to the 473. If your figures are a good ball-park for actual engine weights (roughly 300 lb increase from the 384 to the 473?) then it seems that the engine weight difference was perhaps more than a small portion of the total weight increase. Agree with your comments about the Light Eight and must apologize for being a bit sloppy with my styling comments in that I meant to say Alvin Macauley rather than his son Ed, and the 1932 “Senior” grill rather than the 1932 Light Eight grill. I think it was Alvin who ultimately drove styling in the Twenties, perhaps even into the Thirties. I say this because it was he who actively solicited input from the design community, actively engaged and encouraged Ray Dietrich and took a special interest in his activities, and often had special customs made for his personal use that pushed the design envelop further than the standard production Packard. Plus, it was he who undoubtedly approved each new design. I always point to the 1936 Seniors as a high point in Packard design and suspect that these were Alvin’s vision of near perfection. “Near” in that he still had had to offer Touring Sedans with max legroom and still had to keep the body engineers happy, both of which resulted in somewhat mundane greenhouses. Alfred Sloan was just as involved in GM styling as Alvin was at Packard. It was he who hired Earl, set him up with Art & Color and provided high level support for his major product undertakings like the 60 Special. Regarding the 60 Special itself, it is hard to say what would have happened to GM had it NOT happened, particularly the fate of the 1940 Torpedo Sedans, but it is clear that GM was pushing hard on design (longer, lower, wider), hard on proportions (close coupled 3–box sedans) and beginning to put distance between itself and the competition by the late Thirties. Though Sloan and Earl were more cautious than Cord and Buehrig, they were also more careful and realistic. They didn’t push for things like front wheel drive get the height down but rather did it by widening the bodies to allow for a pronounced trans/driveshaft tunnel, and in the process provided 3 abreast front seating similar to the Airflow. Keep in mind, I have no idea what the V-12 actually weighed (and I’m not terribly confident about the straight eight figure, either, in part because it’s unclear which straight eight it might refer to). However, my guess would be that the actual difference in engine weight accounts for half or less than half of the difference, the rest being in engine mounts, etc. The GM conservatism was less a reflection of Earl and more the fact that until Sloan made him a vice president in 1940, his power was somewhat limited. In some circumstances, Sloan backed him up, but in others, Earl didn’t get his way. Fender-integral headlights are a prime example: Earl pushed for them early on, but Bill Knudsen put his foot down, saying it wasn’t practical, so Lincoln beat them to the punch. Earl had a better relationship with some divisional managers than others — Buick’s Harlow Curtice went out of his way to befriend him — and since he was not yet an officer of the corporation, he was dependent on those managers to play ball. Sloan had a voice, certainly, but I don’t think he was as involved as Macauley was at Packard; at Packard, the board and senior officers could be more directly involved in styling and product decisions, which wasn’t really the way GM worked at that point. Thanks for the clarification on the name. I constantly struggle with the last name let alone the first. My guess is the engine is the dominant weight. Suspension and mount weights are not of the same magnitude as an engine. Even a beefier frame forward of the A-pillar would not be of the same magnitude. Alas, I could be totally wrong. Often times am. But on this I would need to see data to believe differently. I don’t doubt that GM’s brass put the brakes on Earl many times and his “official” status within the company was not as high as his persuasive status. The thing Earl did was get the big one pushed through, the low 3-box close-coupled torpedo sedan. That was THE big style development of the Thirties and its legacy is with us today. What a difference between GM and Packard in those years. One company very much conscious of style and headed by a guy who went so far as to give a studio demo to the execs on the importance of low height by having his team remove a body from a chassis, cut it up to lower it, then place it back on the chassis. Meanwhile over at East Grand it took someone like Darrin to literally crash a dealer party to wake them up to the importance of style and where the trends were headed. Correction, the now familiar sedan proportion was one of two big styling developments of the Thirties, the other of course being streamlining. I was trolling for info and photos of the original “Twin Six” on the internert and linked to this article. Being a habitual visitor to this site, I re-read this article. I may have stated this previously but, the accuracy of your articles is astonishing. I am no expert but when I read many other historys of cars i am maddended by the inacuracys that are so evident. Thank you for your accuracy. Of course, certainly Packard did build another V-12, though it wasn’t intended for cars, and was produced under license from Rolls Royce. An excellent point. Packard’s marine engines, used in wartime PT boats, were V-12s, also. Is this supposed to be 1927? Oops, you’re quite right. Also, “principal in-house designer” would be more accurate; initially, Packard had only a couple of designers and I don’t know that any of them had much in the way of formal titles. I enjoyed reading your site on the 1917 Packard. I was interested in it because my grandfather not only built the “twin 6” engines in Elizabeth, N.J, he also flew them in WWI, in his DH-4. He worked for liberty aircraft in 1917. Packard never had a ‘V-12’. 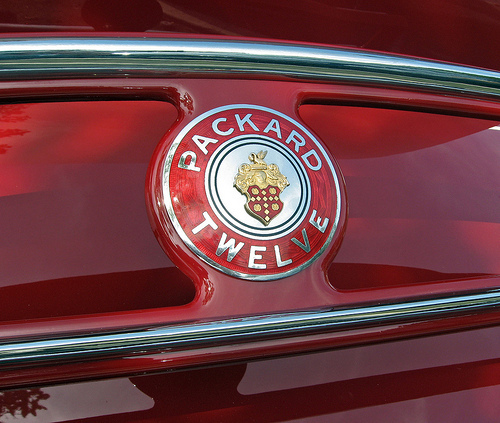 Packard had a Twin-Six and a Twelve. I would be very interested to see any Packard literature refer to its engines as ‘V-12’. I know there was none in 1937. Also, the noted authors, Beverly Rae Kimes and Robert Turnquist never used the term ‘V-12’ in their books. It should also be noted that Packard built the Merlin engine under license from Rolls Royce for the P-51 and Lancaster bombers. Packard Merlins had refinements that created more horsepower. The text draws what I think is a reasonably clear distinction between model designations or trade names — in which case you’re correct — and technical description. 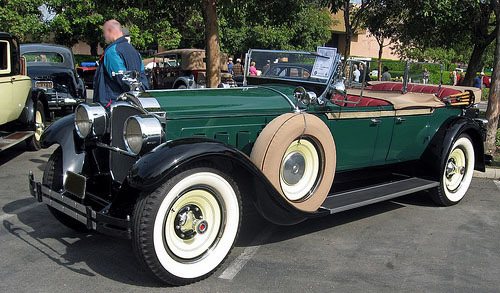 Cadillac, too, described its 12-cylinder model as “Twelves,” but that engine was nonetheless a V-12, as was Packard’s. There are cases in which it’s reasonable to observe certain fine points of technical distinction (not all horizontally opposed engines are “boxers,” for example), but how exactly would you generically describe a 12-cylinder engine with two banks of six cylinders each arranged in a vee angle of less than 180 degrees on a common crankcase if *not* as a V-12? The Merlin was of course a very significant aircraft engine, although its history and development is beyond the scope of Ate Up With Motor. Without the Merlin, Germany would have won the war in Europe. Fortunes were expended prior to Rolls-Royce involvement. RR have the right to “own” the V12 over any others. Full throttle, full load until destruction, revise, repeat. etc. I suggest that you open a chapter on Military direction & funding that was “ate up”, by motor Coys. Example- Cadillac’s 135 degree V inherently would have provided massive torque from idle. Easier to marinise too. Low CG. Am sure there is a dual purpose story there. The Merlin of course was a fine engine, but the challenges involved in production car engines and aircraft engines are quite a bit different and the lessons that apply to one application have very little to do with the other. For instance, passenger car engine doesn’t have to worry much about disturbed airflow in high-alpha maneuvers or inverted flight, but aircraft engines don’t have to contend with wildly varying throttle settings and loads from off-idle speeds, which presents an enormous challenge for passenger car engines. Cooling requirements are also wildly different. So, it’s really very much apples and oranges. It turned out to be one very fast machine! I found it to easily outrun the state police in Michigan with one of their big Fords when one tried to stop me for having my younger brothers (kidnapped) to go camping on Labor Day week end 1961 in the U.P.. The freeway hadn’t been built yet, so that trip should have taken 8 hours… I took 4 hours averaging 89 mph! This involved stopping for a refill of 30 gallons of gasoline (not self serve). and a burger for a snack for each of us. I couldn’t tell what speeds we went as the meter only read to 100 and broke right away when I asked dad if we had time for the police when I saw the ‘bubblegum machine light up’. Unfortunately I had to give the automobile up to be able to afford to raise a family. PS Should have kept the car, would have been better for me.